Residents and their families choose Santa Teresita’s Manor Skilled Nursing because of the high quality and comprehensive scope of services offered. Our skilled nursing accommodations also provide residents with comfortable and dignified settings for care. The Manor’s unique and welcoming atmosphere, together with excellent accommodations and services delivered by a compassionate, experienced staff, have made us a first choice for geriatric care. Nestled in the foothills and located on our beautiful Santa Teresita Campus, the Manor offers residents breath-taking views of the San Gabriel Mountains and access to courtyards and gardens throughout our warm and spacious grounds, which promote healing and wellness. Our semi-private rooms boast of spacious floor plans, and our private bedrooms, which are specially designed and decorated with all of the comforts of home, include a private bathroom. 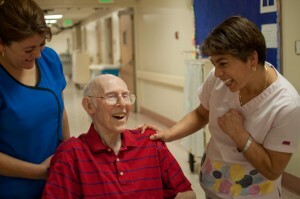 Santa Teresita Manor is dedicated to maximinizing the quality of care in every area, including nutritional care. Three nutritious meals are served daily in a variety of combinations that are appetizing and flavorful. We provide clinical nutrition as well as food services in the spacious Virginia Dining Room that is beautiful and inviting. All meals are specially prepared in order to meet the particular dietary needs and/or preferences of each resident.